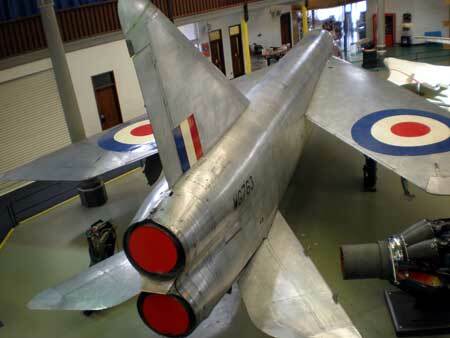 Lightning P1 prototype pictured in the Manchester Museum of Science and Industry. In 1954 the first British aircraft to fly at the speed of sound in level flight. Designed and built by English Electric, Preston. The aircraft was built at the 3 sites around Preston: Strand Road, Samlesbury and Warton. And at English Electric in Accrington. Strand Road was the metal bashing factory producing the fuselage components that were wired and sent to Samlesbury for assembly. 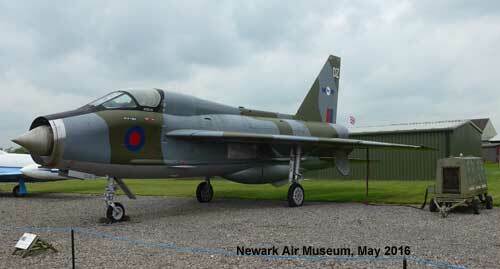 The aircraft were then flown to Warton for final installation of electronics and flight testing. The Lightning was two engines with metal wrapped round them. A mighty roar, reheat power to the end of the runway and vertical into the sky. The RAF had nothing like it until the Typhoon. The Lightning was exported to Saudi Arabia and Kuwait and was the first of a long relationship with Saudi Arabia who have also purchased Tornado and Typhoon. 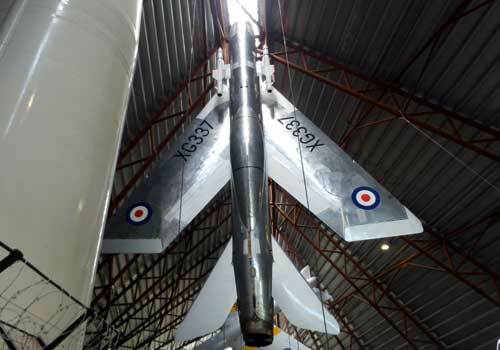 The other P1A Lightning prototype is at The RAF Museum Cosford, photographed below. 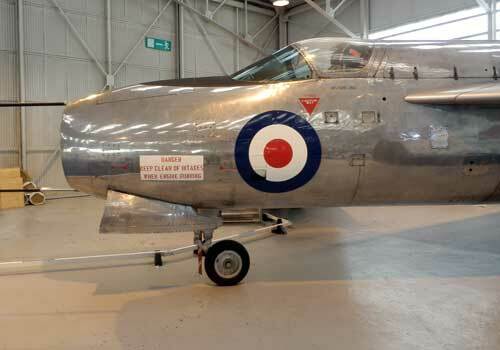 Also Lightning F1 development aircraft XG337 at the RAF Museum Cosford. Lightning was one of the first 'vertical' take-off aircraft and XG337 is displayed in everyones favourite post take-off position. There are lots of books on the subject. Two are commented on below. There is another very large and detailed book that costs ?75 whose name has temporarily escaped. RAF Aircraft Today:2 Lightning by Arthur Reed. Ian Allen books. A book with a lot of pictures including early prototype, manufacturing photo's and operational photo's. Short pieces of text between the photo's, beginning in 1947 and ending with stories from squadrons. An appendix listing the tail numbers. A book worth buying, gives a good overview and the photo's fill in the story from the take-off with wheels up at 10 feet to the clean lines of the prototype passing closely above. Fighter Test Pilot - from Hurricane to Tornado by Roland Beamont. PSL books. Two parts of this book relate to the Lightning. The first is the work at English Electric, Warton with a Gloster Meteor in 1947 which proved the need for a replacement aircraft with higher altitude and supersonic capability and how English Electric proceeded with their Lightning design against government policy although much appreciated by the RAF. The second part is Roland Beamonts account of Lightning prototype high speed tests. Design thought too radical, but eventually flew in 1954. Designed and built by; English Electric, Aviation Division, Ltd, Corporation Street, Preston. (this site now an Aldi supermarket with the BAE SYSTEMS factory based at nearby Warton and Samlesbury). Several developments from P1, P1A, P1B, F Mk1 to F Mk6. Supercruise capability (supersonic without reheat). 'Vertical' take off to 30,000ft in 2 minutes, audible for miles. First flew 1954, supersonic on 3rd flight (first British aircraft to do so in level flight), world speed record in 1957, Mach 2 in 1958. 337 built for RAF, Saudi Arabia and Kuwait.